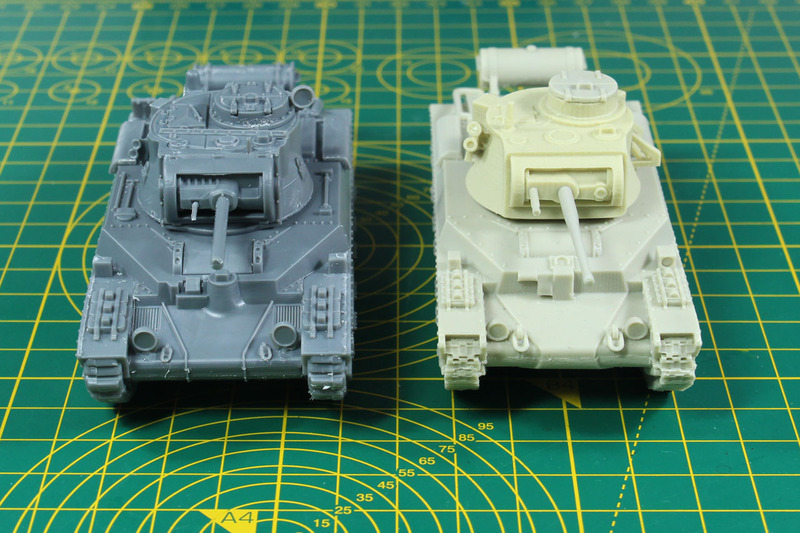 The latest plastic vehicle kit for Bolt Action is the Matilda II, shown here as the tank troop with 3 tanks. 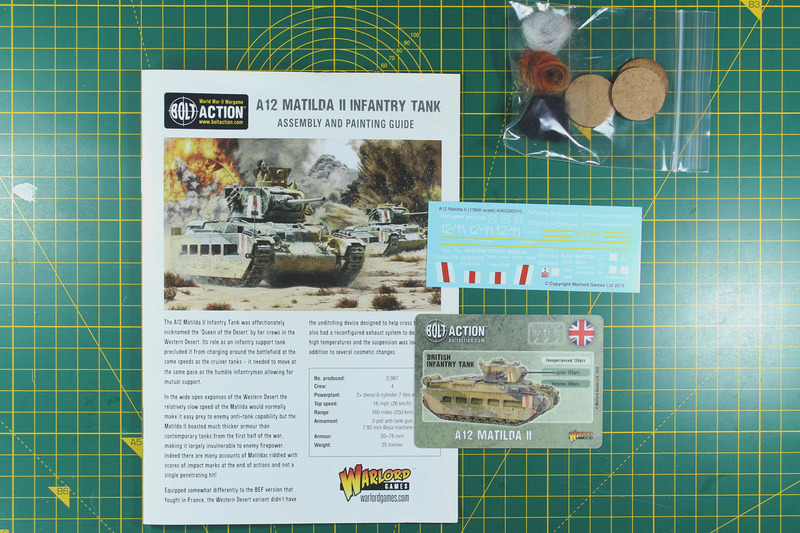 The Matilda II kit available either as a single vehicle boxed as A12 Matilda or as a three tank troop. Of the Matilda Mk I only 140 units were build and the successor Mark II saw action in early in the war in France, but became more famous in the Desert Campaign against Italian tanks. The A12 / Mark II was produced between 1939 and August 1943, with a production run of around 3,000 units. Roughly a third of these were delivered to the Soviet Union under the Lend & Lease agreement. Captured Matilda II were used by the Germans under the nomination Infanterie Panzerkampfwagen Mk II 748 (e) or Pz.Kpfw. Mk II 748 (e). 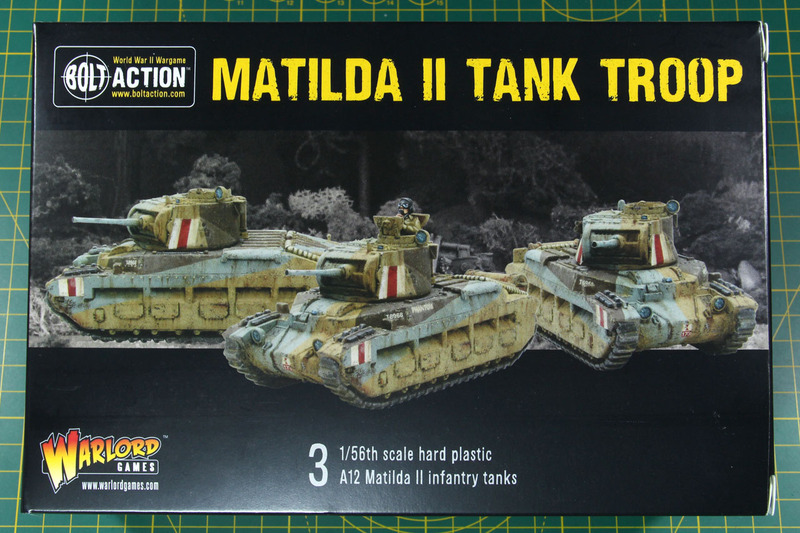 While the British replaced the "Queen of the Desert" beginning 1941 with Valentine tanks, the Australian army used their Matildas until the end of the war. A few of the Matilda II were re-fitted with flamethrowers and used as Frog or Murrays by the Australians in the pacific. 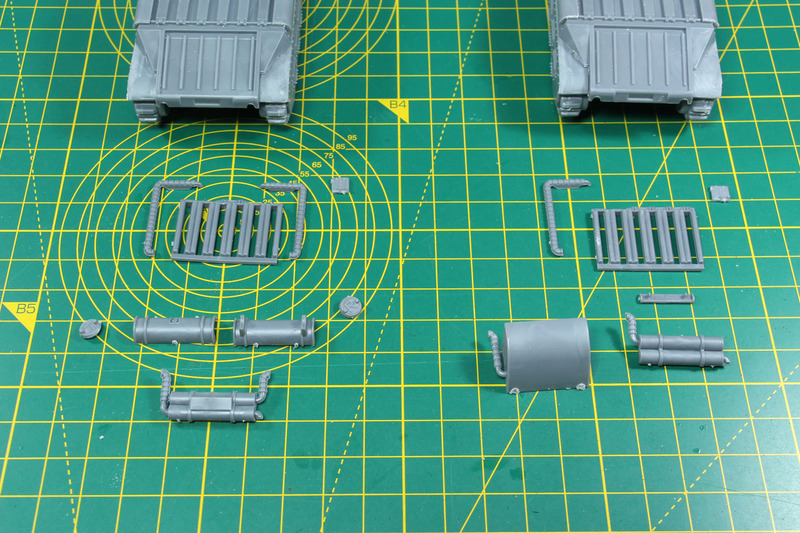 These sprues are made from medium grey hard plastic and cover the parts needed for the A12 incl. different variants. 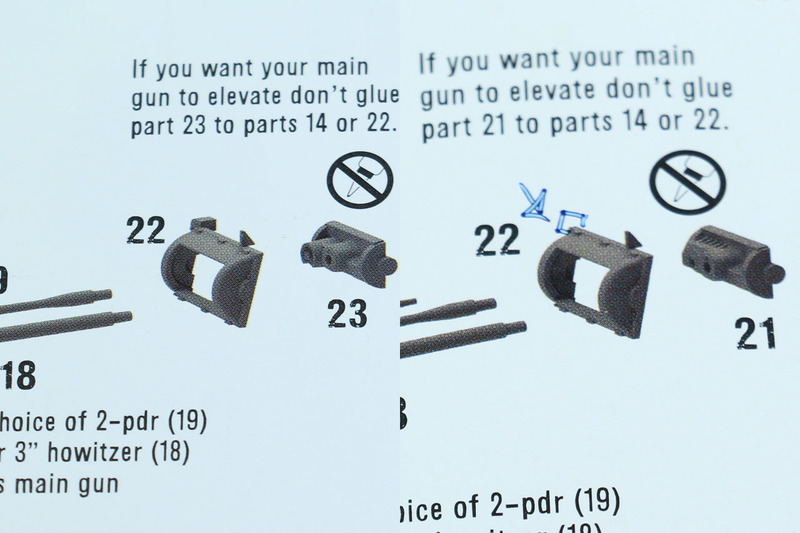 The parts are not numbered on the sprue, only an illustration in the assembly instructions gives you guidance with that. 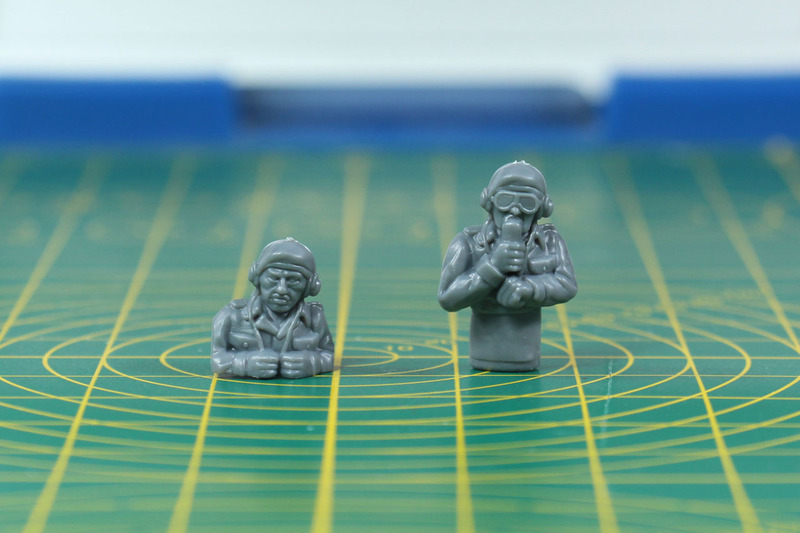 The quality of the casting is fair to middling, with partly very present mould lines. 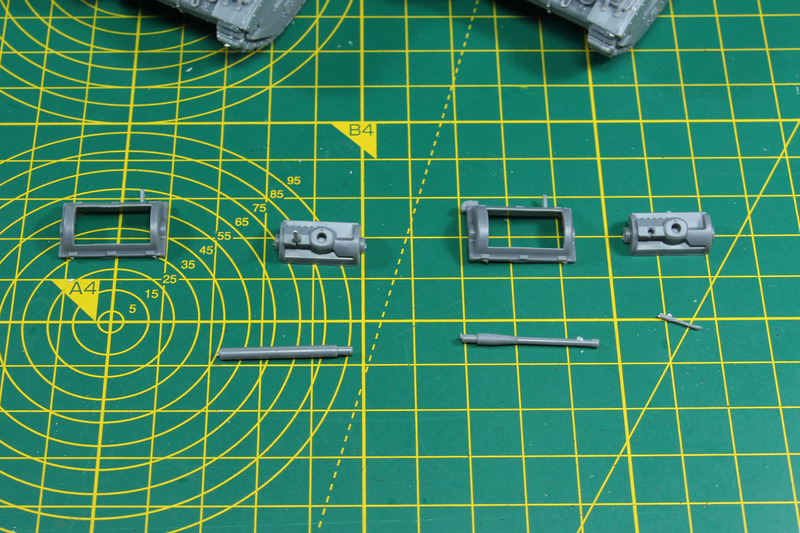 Some smaller parts like the turret MG are not well defined. 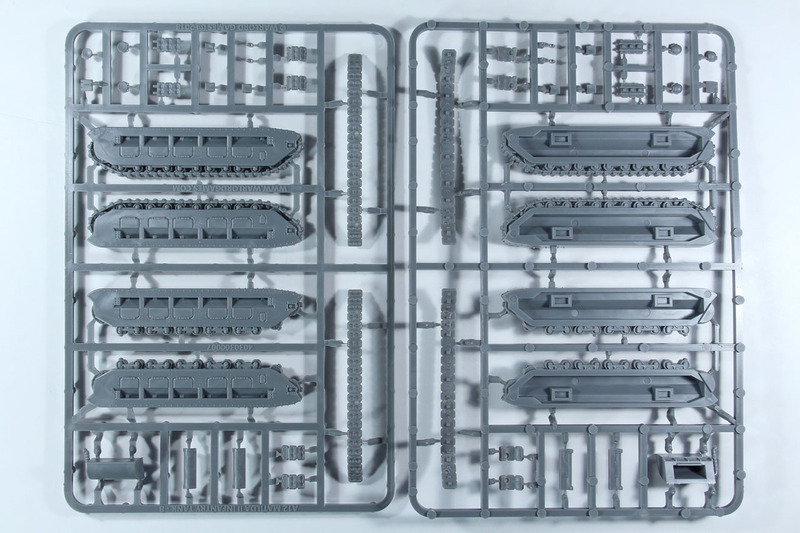 As usual we begin with the tracks, this kit has two different track sections. Single piece tracks for left and right, as well as raised ones for the early BEF variant. It is a bit difficult to properly remove the mould lines along the tracks and the top surface of the side track sections is not entirely flat / slightly dented. 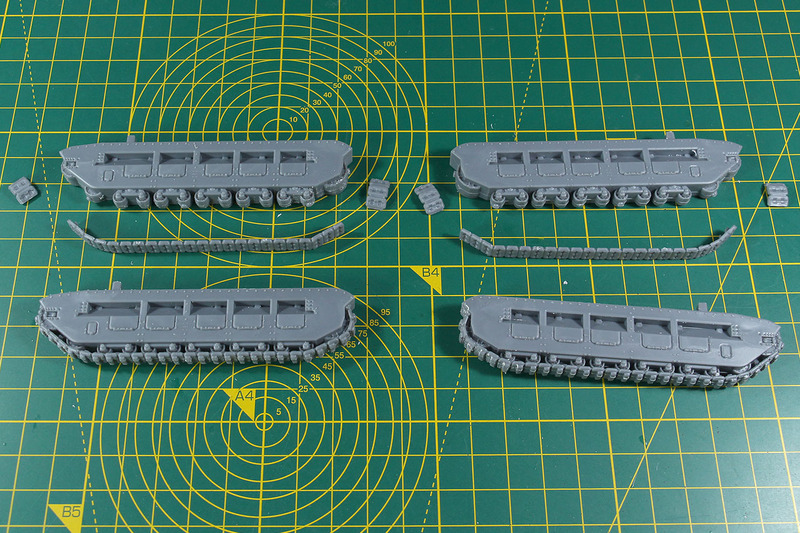 As I am going to build two vehicles fighting in the Western Desert and one for British in Burma, I went with all lowered tracks. The chassis itself is pretty simple. 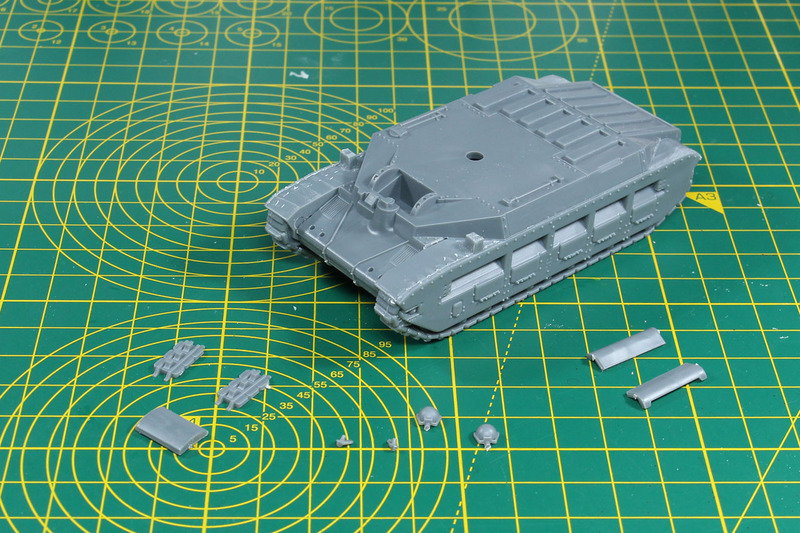 You have the tracks on each side, the lower hull and upper hull. 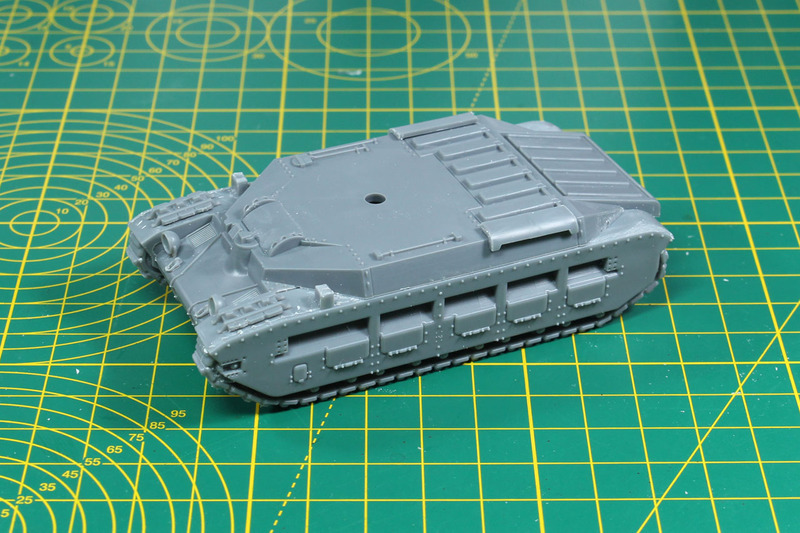 I added lead to the chassis to increase the weight of the plastic tank. Fit is quite solid and assembles easily. 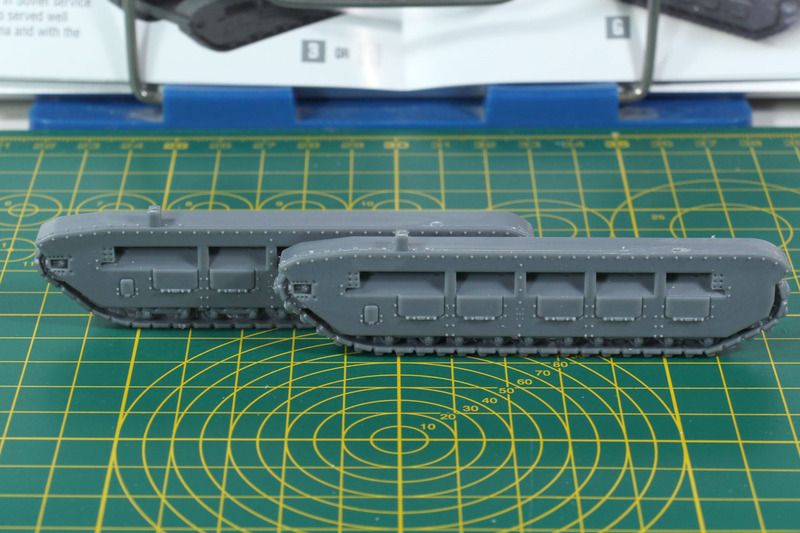 The hull receives a couple of detailed add-ons. Unfortunately the instructions are not clear and do not mention the parts that are added twice. There is a driver's hatch, which is optional in case you want to add a crew member in that slot. As the for curved side covers, these fit better if you cut off the rivet below them. 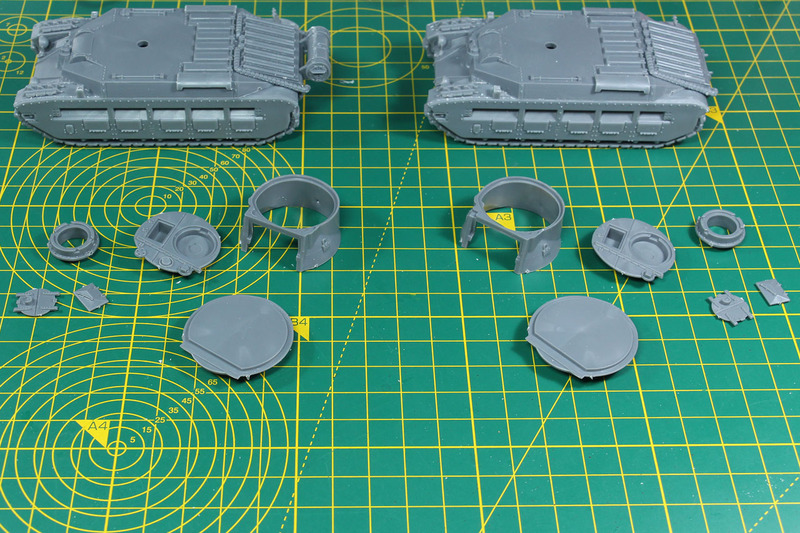 So far, beside the lowered and raised suspension, the tanks are the same. For the three variants are different exhausts included, one with air filters (?) for the Western Desert, an unditching skid for the BEF and a late "plain" one for Lend & Lease, Burma or Far East. 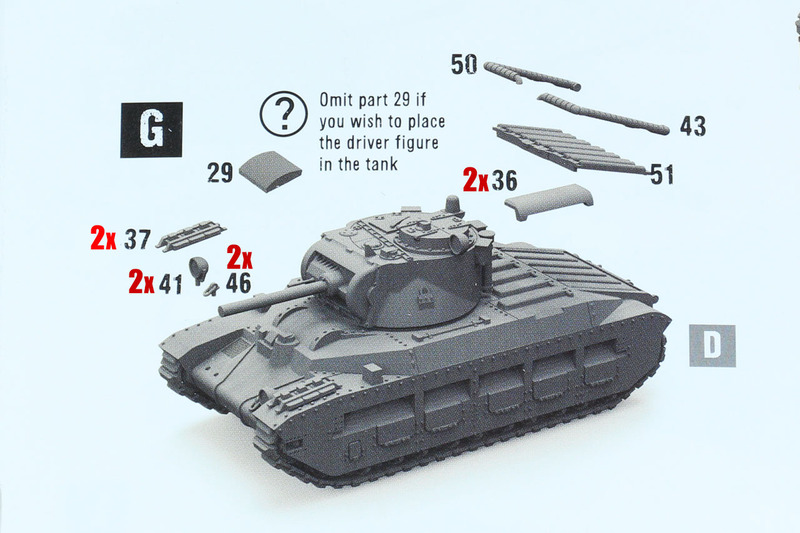 The instructions for the Lend & Lease soviet A12 show part 30 even as it is already attached in the instruction, and for the Western Desert it is shown but not mentioned. You'll need it either way. 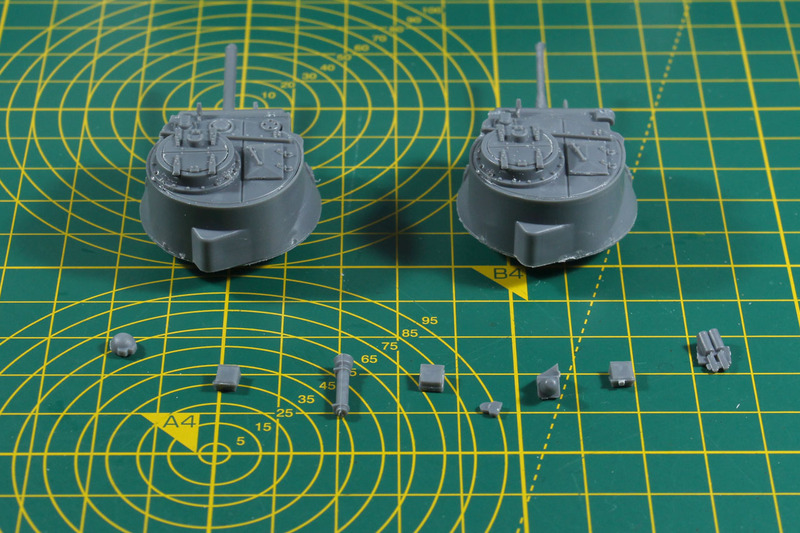 There are two different types of turrets with this kit, minor difference in the gun mount and frame as you can see here side by side. And another error with the instructions. 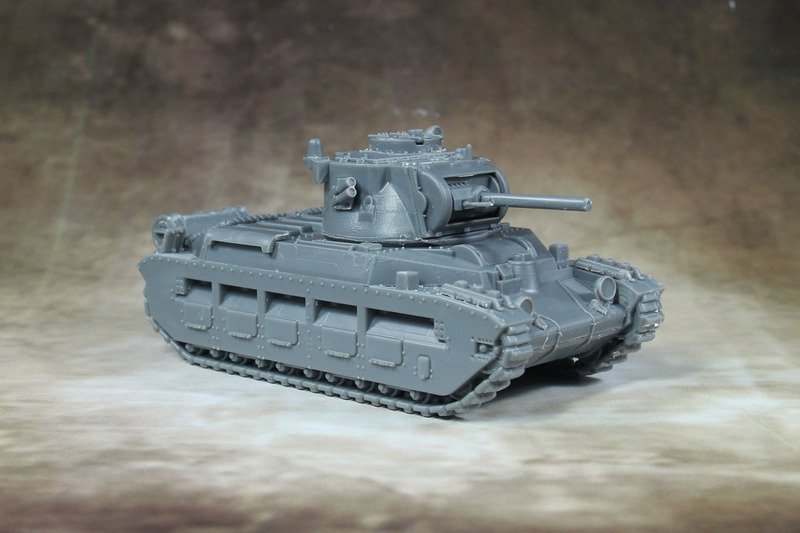 For the Lend & Lease A12 the frame of the gun mount is wrongly shown part 20 as part 22. You'll need to use the part with the small box in the upper left corner. One turret was armed with the 2 pdr, the other one with the 3 Inch howitzer as a main gun. 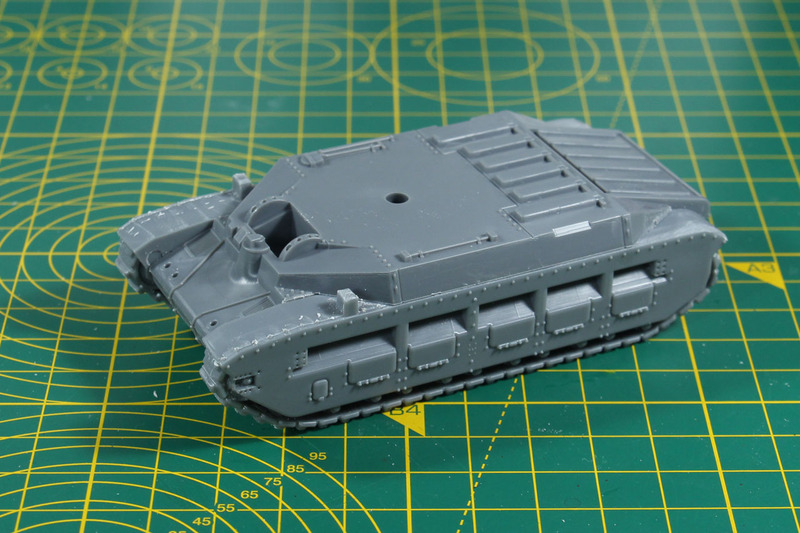 Now the smaller parts are added to the turret. These are the same for both. But they don't have any guidance and are glued "freehand" to the crown. Usually there are small nooks or something for orientation. Especially as these parts are not optional it makes design wise no sense to handle it this way. 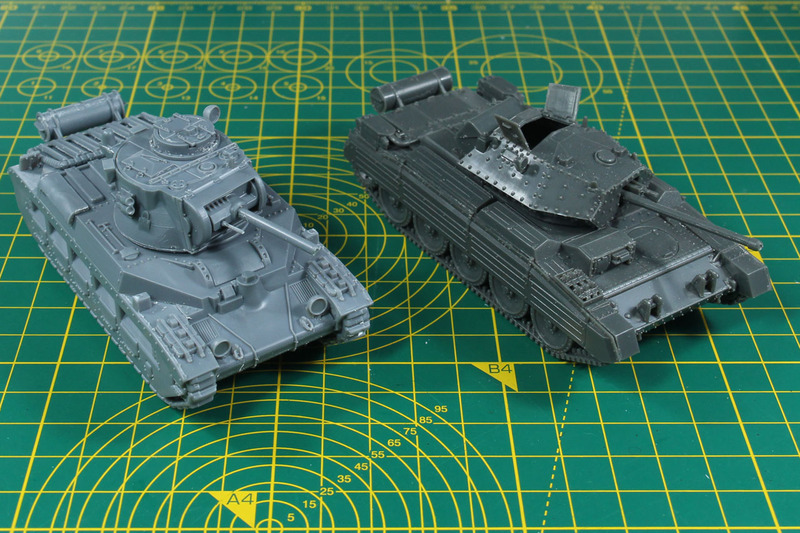 Last but not least, the A12 comes with two different crew members, a driver and a tank commander. 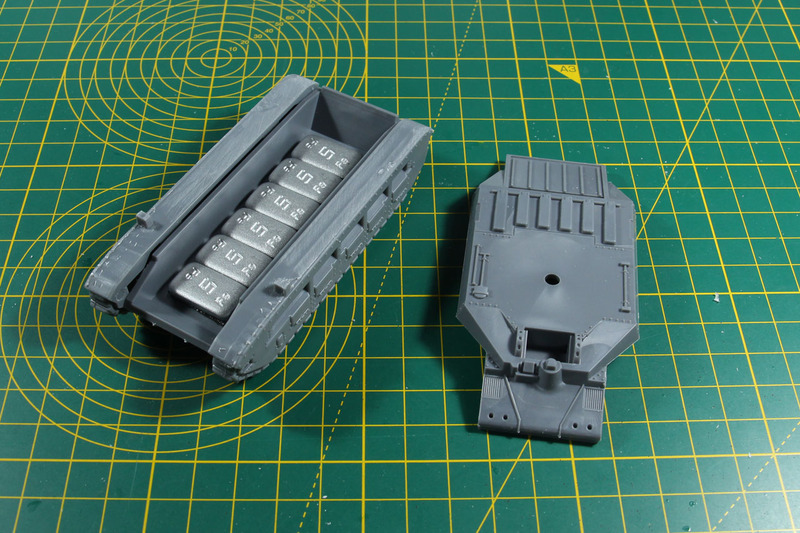 If you cut part 25 carefully in two (and cut off some of the outer rim) you can build an open commanders hatch and put the tank commander in there. 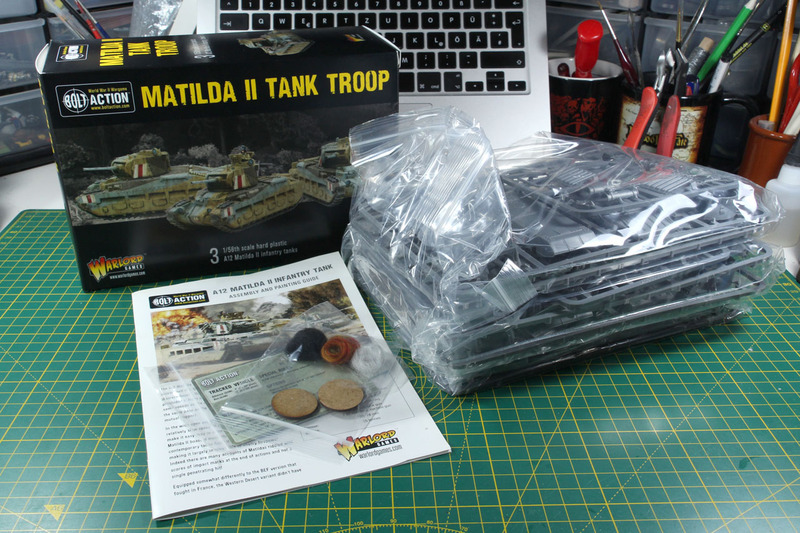 I bought a 1/56 scale Matilda from Blitzkrieg Miniatures a while ago. Wasn't too keen on that kit, as the cast of the resin towards the bottom becomes a bit of a mess. 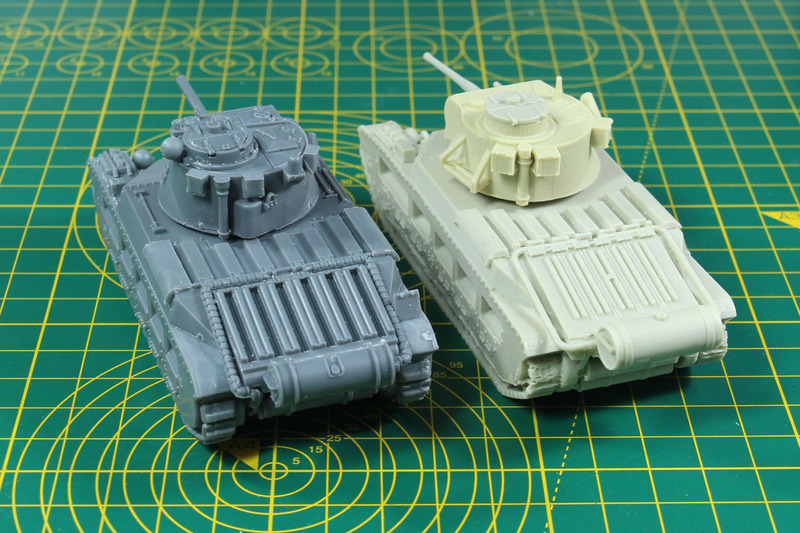 Beside that the 3d printed master wasn't properly cleaned, so you can see the steps of the print in the resin cast (unfortunately similar steps are seen on the turret of plastic kit by Warlord). As you can see the kits interpret the details differently, but the size is pretty close to each other. 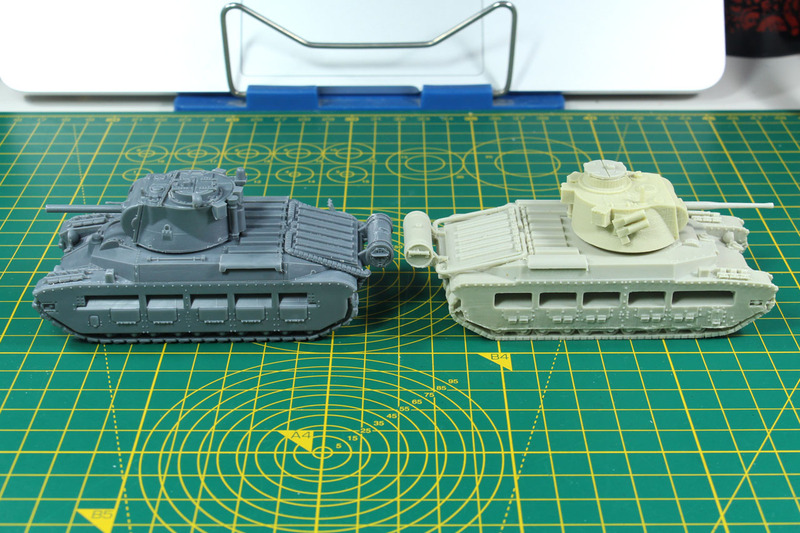 Here the Matilda is next to a Crusader tank, as you can see some similar elements of the British tank pattern, as you can see on the back and front. And of course, no review would be complete without the backdrop pictures. Well? What shall I say? 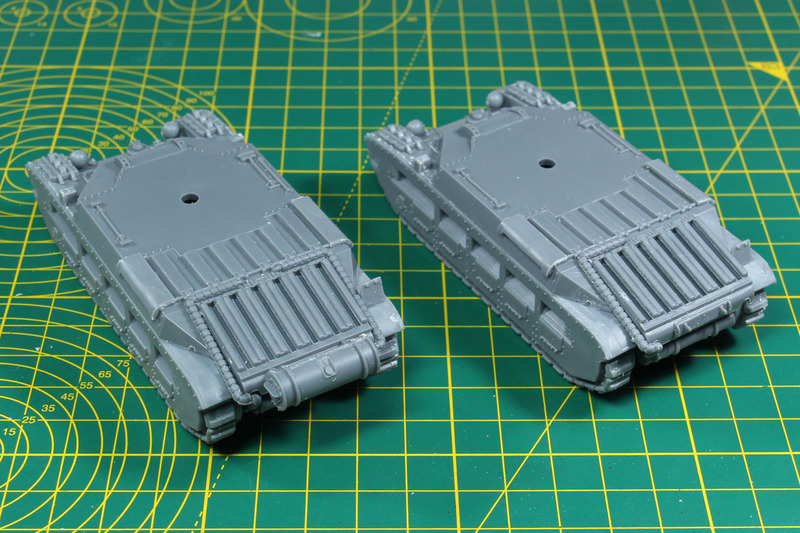 I was looking forward to this kit, as the plastic tanks / vehicles that Warlord produces on their own are usually a bit more solid compared to the Italeri kit. But this feels rushed and I don't really know why? The mistakes in the instructions were unnecessary. 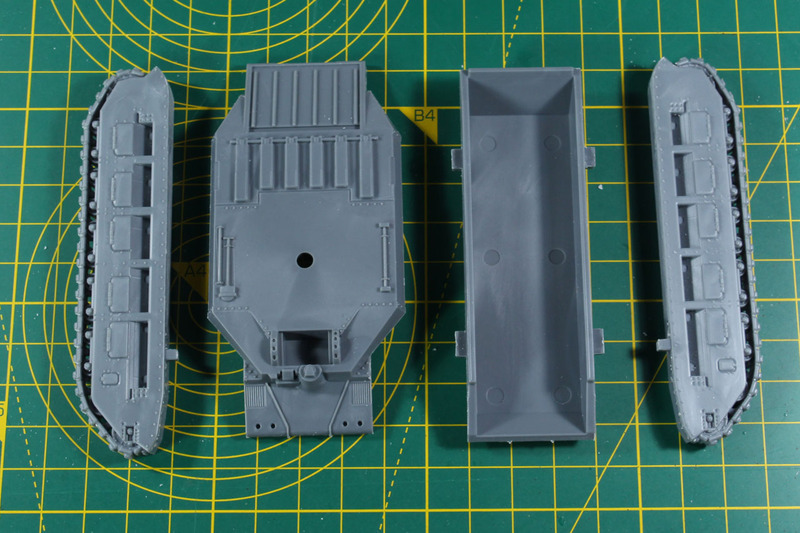 Developing, producing and casting a plastic kit isn't easy, I am aware of that. Especially with larger kits it gets more difficult. But this kit could be better. 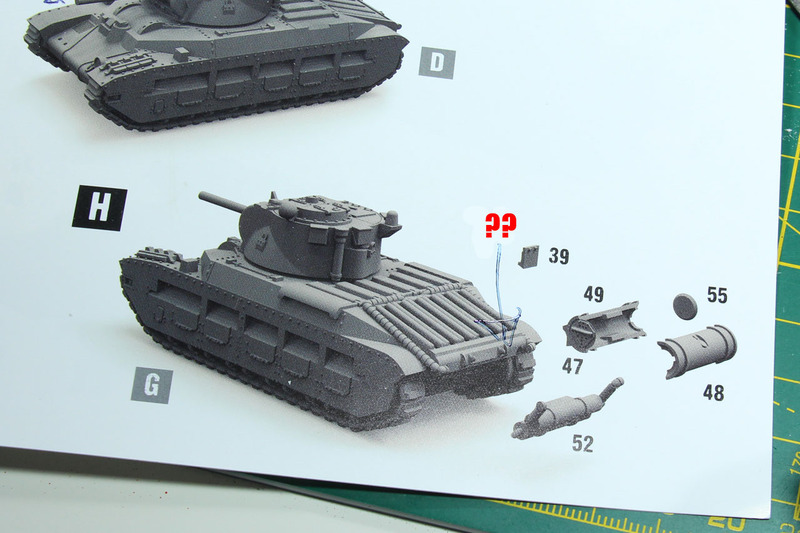 Why there are no joints for the details on the turret to connect to, or why the turret has steps is simply beyond me. 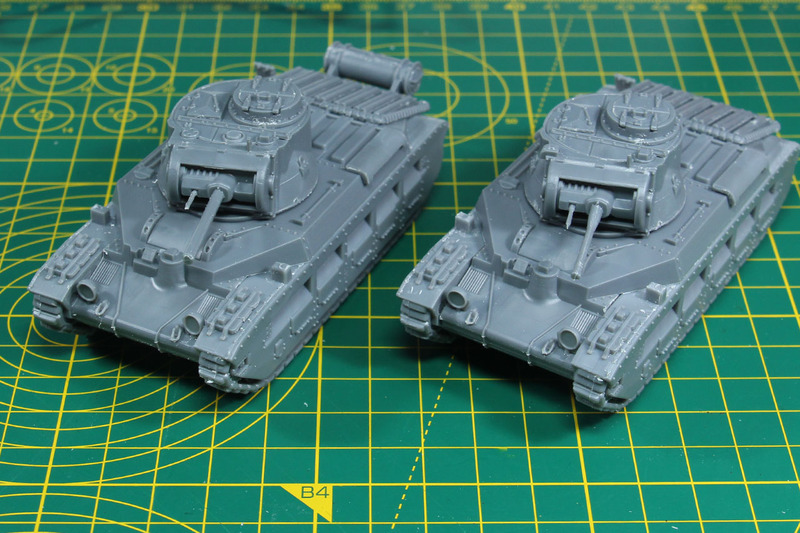 Assembling the tank is rather easy and doesn't take too long, but feels inconvenient. 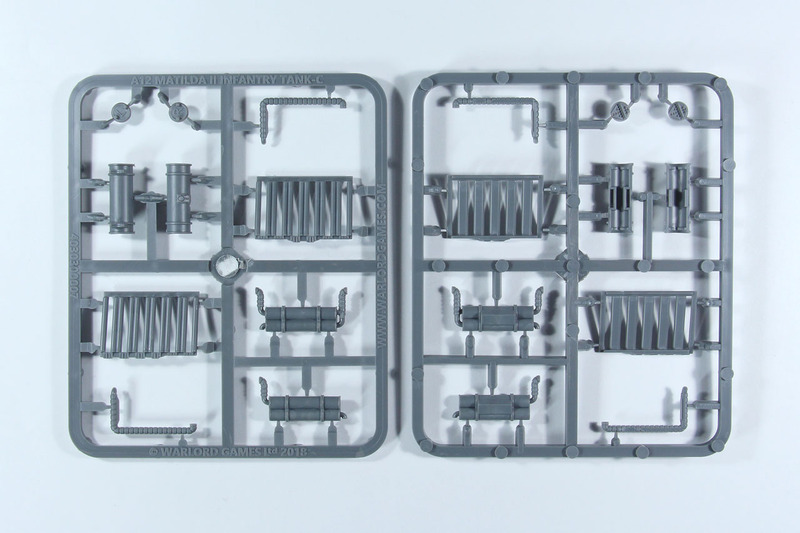 Due to the fact the part numbers aren't printed on the sprue, you have to browse forth and back in the instructions and cleaning the mould lines takes up most of the assembling time. Especially along the rivets this is rather annoying as you have to be cautious not to damage the designs. Still, as the only other options are currently resin kits. 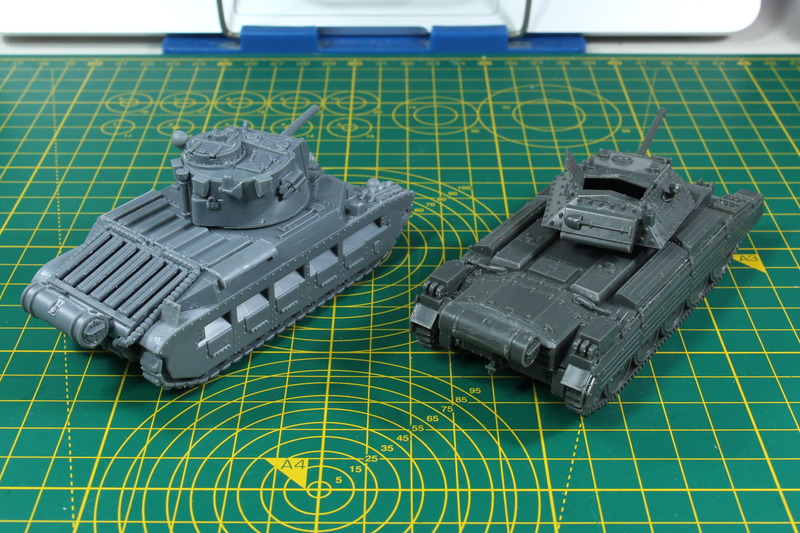 The Blitzkrieg kit costs 22 GBP and is incredibly easy to assembly, as it plain resin and only a few parts. 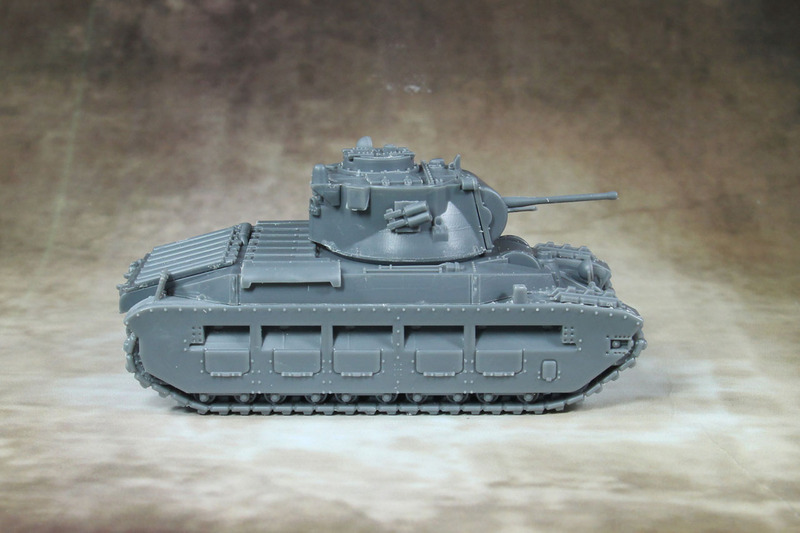 The resin Warlord kits cost a whopping 26 GBP and are available for BEF, Desert and the Australian multikit. 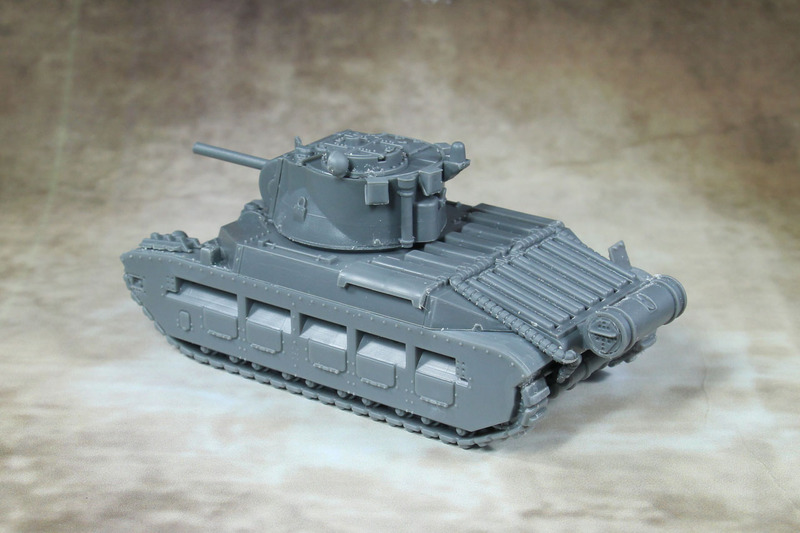 About the last one, it would have been easy to include that variant in this kit, as it covers a third barrel (for the flame thrower) and some kind of front track guards, if you're already going through the trouble of developing a plastic kit. So what's my conclusion? We have a plastic kit that is cheaper than the resin ones, has a decent fit but flaws in construction, but is still easier to handle than the hybrid kits. Not a bad kit, just quite a bit behind what it could be. 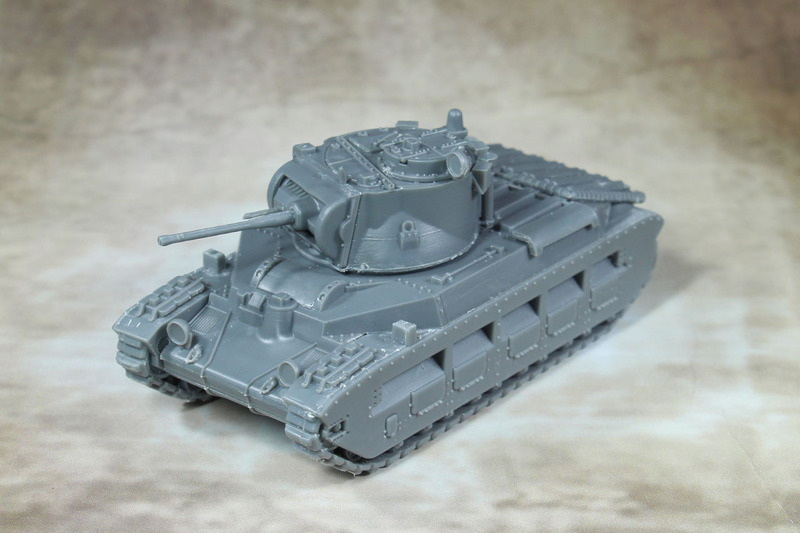 Bolt Action is a brand of Warlord Games. 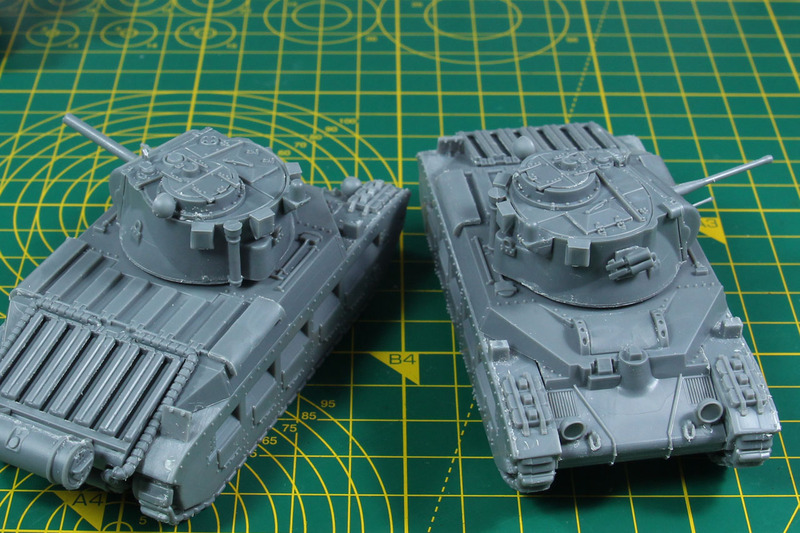 Nice review, a couple of things: I have looked at your pictures and I cannot see the 3D printing lines on the turret. 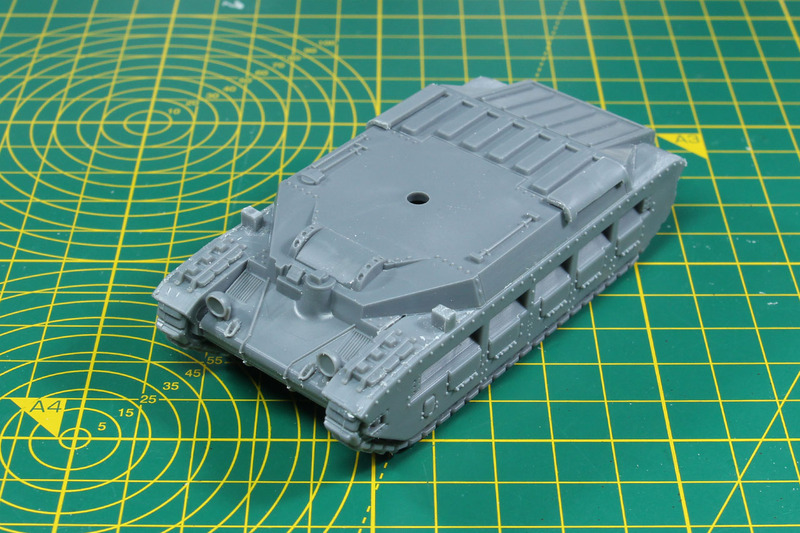 I see a bit of roughness, but having seen the real thing (the tank not the model) and looking at your pictures, it could be an attempt to replicate the actual cast turret rather than a fault! 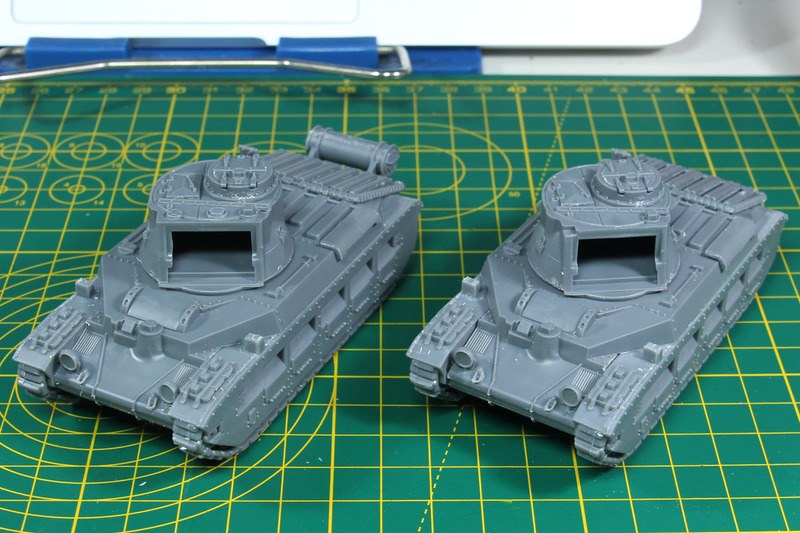 I see the line on the Blitzkrieg kit, and having built and painted their M3 there where also on it, but after priming and painting they more or less disappeared. 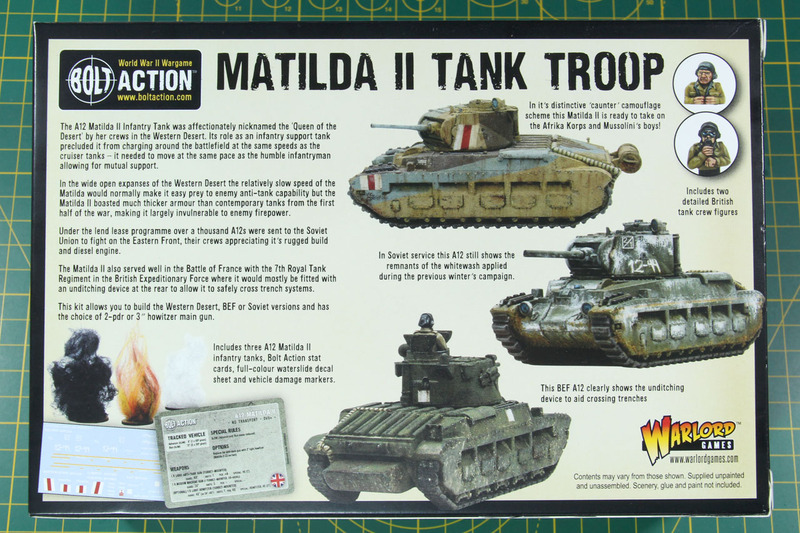 By the way, the British Army (and the Indian army too) never used Matilda in Burma. 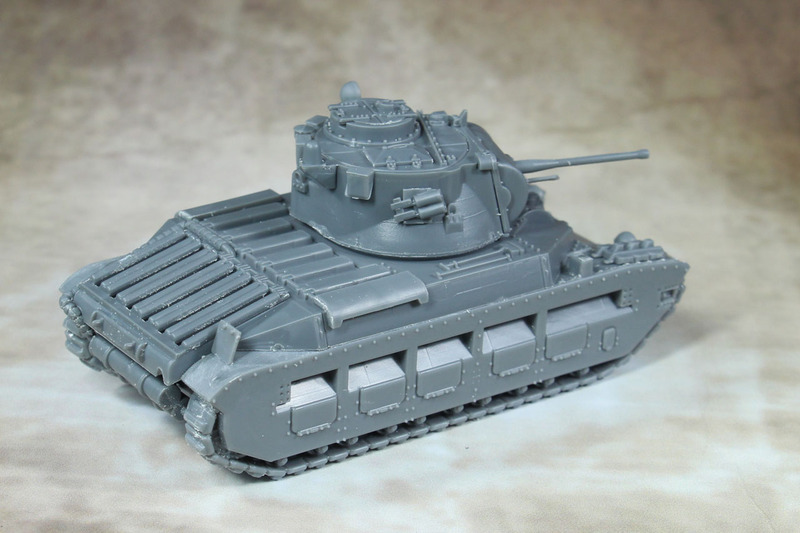 In 1942 they had Stuart with the 7th Armoured Brigade, in 1943 (Arakan) they used a squadron of Valentine, then the force was made of Lee (with some Grants) Sherman, and Stuart in later marks. The Australian used them in New Guinea and Borneo. PS: I need to thank you. In other places people had snobbed Warlord plastic Landsknechts, but your review was positive and I ended up picking a box. 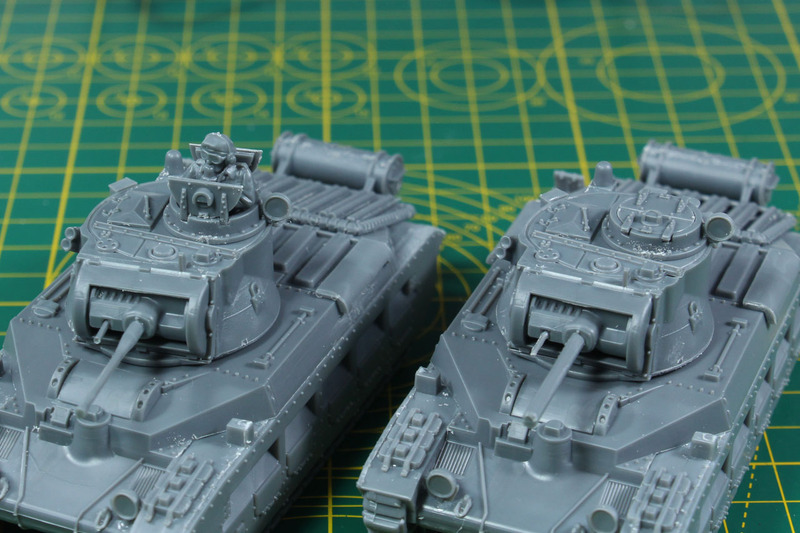 They are much nicer than the naysayers said… (but I got the impression in some place people just criticize Warlords products). Thank you very much for the elaborate feedback. I’m a bit stunned, that they didn’t use the tank in Burma. That stated in such a bold way, that I didn’t double check that fact (and as most of the sources I found, talked about the Australians in the pazific, not going into detail _where_ in the pazific, I went with it). As for the Valentine, seems like I phrased my source “With the arrival of the Valentine in Autumn 1941, the Matilda was phased out by the British Army through attrition, with lost vehicles no longer being replaced” badly, or at least got it wrong, as I read that as an “replacement” of the Matilda. As for Warlord in general, there is good and bad. Some people just see them as historical Games Workshop and are immediately against it, as you have to be against the big guy. 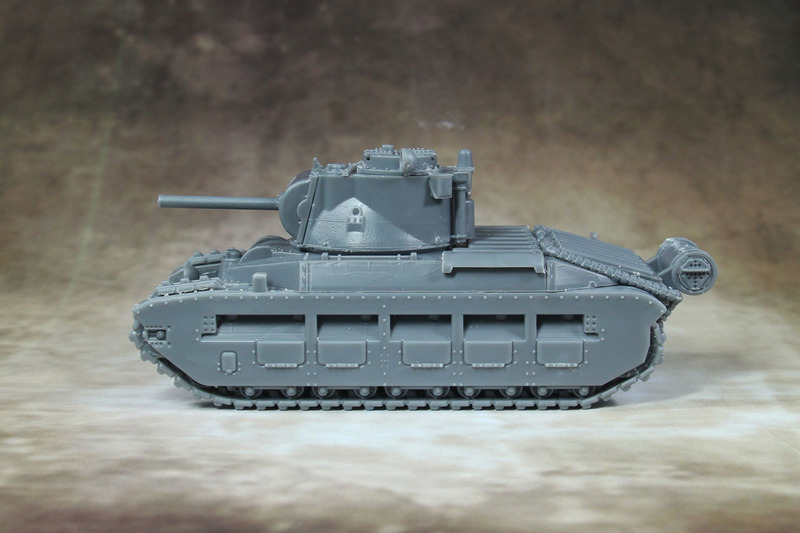 I think it is a good thing to have a bigger player in historical wargaming, I’d prefer a bit more focus or long time planning on some parts of the product ranges, as they are going for a lot of items on a very broad spectrum, and that is going to be difficult to support as well as keep a certain level of quality steady.